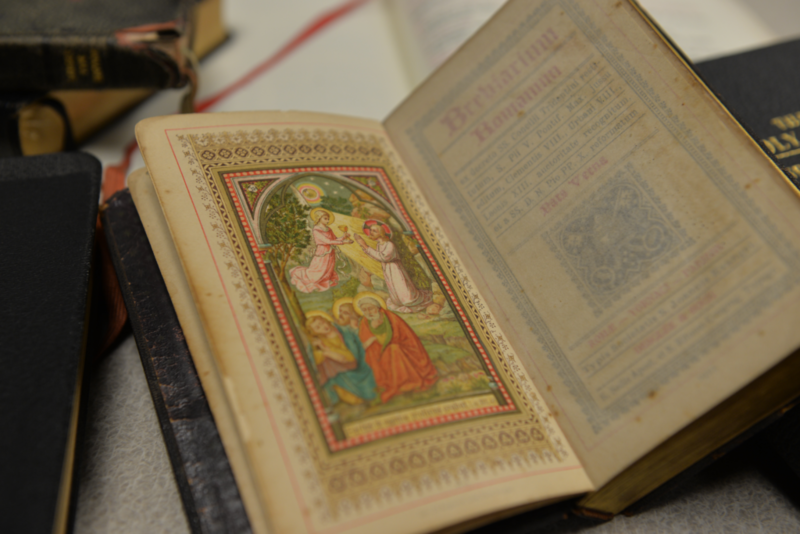 There is something wonderful about old Bibles, missals and prayer books. It’s obvious that some of them were well loved and often used, worn tools for sanctification in the holy hands of unknown saints. Sometimes the former owners have their their names inscribed on the flyleaf or title page. Occasionally you may find a presentation paragraph written in the book — gift of minister, a friend or a parent, sometimes given on a special occasion with hope for the recipient. On my shelf I have a “New American Bible” of 2001 that was given by the Lawrence Catholic School PTO to a boy named Zac. I assume it was given as a confirmation present. I’ve prayed for Zac, and wondered whatever happened to him. I hope his faith is alive and growing. A month ago, I made a wonderful find in a Salvation Army store: a near pristine, 1952 first edition Revised Standard Version translation of the Bible. It was a gift, in 1962, to a man who attended a Presbyterian church in North Kansas City. The translation is majestic, solemn and rich. I love reading it. In one sense I’m glad that this RSV is in good shape — but in another sense I’m sad, too. Obviously, the man didn’t read it often. Bibles that have been marked are interesting — sometimes carefully, sometimes carelessly, sometimes in a rush of inspired zeal. Underlined or highlighted, God spoke to them through that particular verse during a particular time and for a particular purpose. I can read anguish, doubt, joy, brokenness and repentance in their markings like the blazing of a trail. Usually, these old Bibles, missals and prayer books have been prayed into tatters. They have a worn dignity about them, like an aging aristocrat. A book that is worn is a book that has been loved. With the worn missals, I can always find the ordinary of the Mass, because those pages are darkened with the oil of fingers turning them during Mass after Mass, year after year. I can’t help but feel a special connection when I pray using my father’s old “Christian Prayer,” or the breviary used by a Sister who died many years ago. What would she think of me praying the Liturgy of the Hours with her old breviary? Does my father pray with me, in heaven, as I pray on earth with his worn breviary? The things you can find in these Bibles and missals can say a lot about the owners and the times they lived in. I bought an old missal that was used immediately before, during, and after the Second Vatican Council. It was published in the late 1950s and, typical of Catholic missals of the time, had the ordinary of the Mass in English on one page and Latin on the opposite page. This missal has holy cards with saints, prayers and funeral cards. It has a special prayer card for the success of the Second Vatican Council. Tucked in also I found a brittle, laminated “cheat sheet” card for the people’s responses for the new, translated Mass in the vernacular that came at the end of the Council. It was very much like the cards we used when the Third Edition of the Roman Missal was introduced in 2011. Just a week ago I found in a Goodwill store a “New Oxford Annotated Bible” for only $2. I can’t wait to explore the treasures within — Old Testament Apocrypha found only in the Bibles of the Eastern Orthodox Church: 3 and 4 Maccabees, Psalm 151, and the Prayer of Manasseh. Don’t throw away your old Bibles, missals and prayer books. Keep them and mine the treasures. And then pass them on.